The Preservation Fund support the Botanical Gardens with a grant to propagate 500 Soufriere Trees (Spachea elegans) with it’s beautiful pink coloured flower and 500 Lignum Vitae trees aka the tree of life with it’s beautiful blue flower. The Soufriere Tree flower is officially recognised as the National Flower of St. Vincent and the Grenadines. Unbelievably there is only ONE of these trees in existence in St. Vincent and the Grenadines (at the Botanical Gardens), apparently most Soufriere trees were wiped out in the 1804 hurricane. Furthermore there are only two Lignum Vitae left in SVG, as these trees were harvested to near extinction to build boats for their incredibly hard wood by sailors plundering the region. 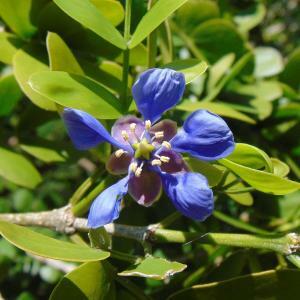 We’ve successfully propagated the Lignum Vitae, however the Soufriere trees have never fruited or set seed even though they flower profusely and the flowers are bisexual. Both species can still be seen at St Vincent Botanic Gardens. 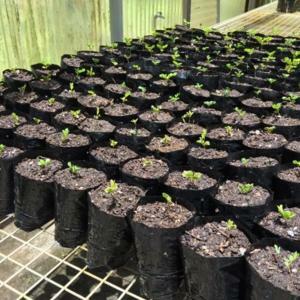 Teaching children about propagation is a key component of the project. 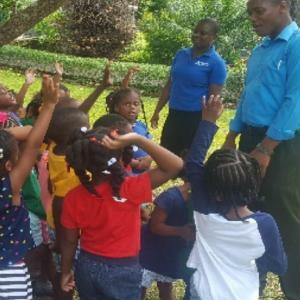 Seen here are children from Head Start Pre School visiting the project with Project Manager, Curator Mr Gordon Shallow.